New Inverness location will help ensure peak performance for athletes and those with everyday injuries. AURORA, Colo. – Patients throughout the Rocky Mountain region will soon have access to new sports performance and advanced orthopedic services as Steadman Hawkins Clinic-Denver joins UCHealth and the University of Colorado School of Medicine. Already, surgeons at Steadman Hawkins Clinic-Denver, UCHealth and the Department of Orthopedics at CU are performing groundbreaking procedures including stem cell therapies, orthobiologics, innovative devices and clinical trials. By combining forces, the new team can provide one of the nation’s most advanced and innovative sports performance medicine programs. 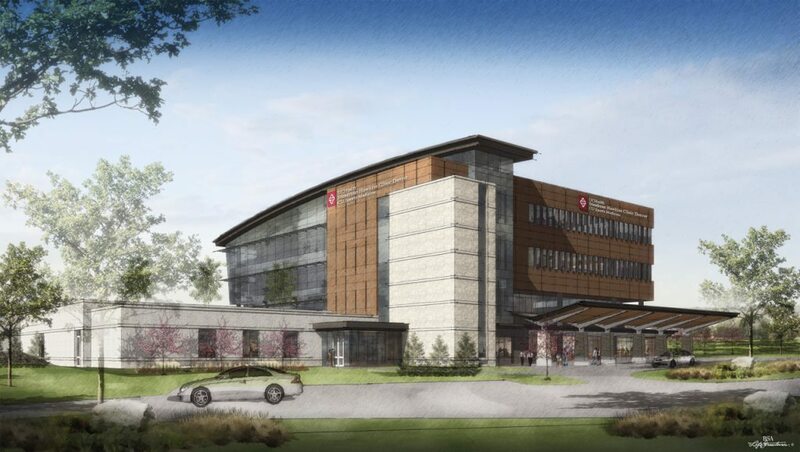 UCHealth is building a new, state-of-the-art health center off Inverness Drive in Englewood to provide a robust sports performance program including physical and occupational therapy, surgeries, imaging and clinic appointments. The program is designed to maximize performance and injury prevention for athletes at all levels. Steadman Hawkins Clinic-Denver has focused on education and research and provided world-class orthopedic care for athletes, non-athletes and weekend warriors for 23 years at their Greenwood Village and Lone Tree locations. Their seven surgeons and additional providers are joining the faculty of the CU School of Medicine’s Orthopedics Department and CU Sports Medicine, one of the most comprehensive sports medicine groups in the western U.S.
“Steadman Hawkins Clinic-Denver will continue to provide excellent care for patients with orthopedic injuries, but by joining UCHealth and the CU School of Medicine, we will now be able to provide a far greater range of services and care, all within the same health system,” said Dr. Thomas Noonan, orthopedic surgeon at Steadman Hawkins Clinic-Denver. UCHealth is a regional leader in sports performance medicine and is a proud partner of the US Olympic Training Center, Denver Broncos, Colorado Avalanche, Denver Nuggets, Colorado Rockies and other teams. UCHealth specialists cared for 69 Olympic and 47 Paralympic athletes throughout their journey to the Rio Summer Games. Steadman Hawkins Clinic-Denver physicians are the official team doctors for the Denver Broncos and Colorado Rockies, providing expert care for these professional athletes. CU Sports Medicine physicians are the team physicians for University of Colorado and University of Denver student-athletes and provide care to the Denver Broncos, Denver Nuggets, Colorado Avalanche, Colorado Rapids and other teams. The CU Department of Orthopedics and UCHealth are also sponsors of the Colorado Storm soccer club, helping kids and teens stay safe and perform their best on the field. UCHealth is a Front Range health system that delivers the highest quality patient care with the highest quality patient experience. UCHealth combines Memorial Hospital, Poudre Valley Hospital, Medical Center of the Rockies, Colorado Health Medical Group, and University of Colorado Hospital into an organization dedicated to health and providing unmatched patient care in the Rocky Mountain West. Separately, these institutions can continue providing superior care to patients and service to the communities they serve. Together, they push the boundaries of medicine, attracting more research funding, hosting more clinical trials and improving health through innovation. Faculty at the University of Colorado School of Medicine work to advance science and improve care. These faculty members include physicians, educators and scientists at University of Colorado Health, Children’s Hospital Colorado, Denver Health, National Jewish Health, and the Denver Veterans Affairs Medical Center. The school is located on the Anschutz Medical Campus, one of four campuses in the University of Colorado system.